The Official LA Galaxy Discussion Thread. Edited by MadSci, January 21, 2013 - 06:14 AM. Wow what a way to blow it tonight, the red card on Jimenez really affected them. Andrew Bynum at Galaxy game right now. Edited by TheMadSci, August 02, 2012 - 08:16 PM. Gotta give this thread some life. After all, it is our local club! Go G's! Anyone else besides me and MadSci Galaxy fans? San Jose on Sunday, Lets go G's! Edited by TheMadSci, November 01, 2012 - 11:56 PM. Big game tonight against the Sounders, lets go Galaxy! The Galaxy will take the Houston Dynamo for the second year in a row for the MLS Cup. It was also announced today that the Cup match against Dynamo will be Beckhams last game as a Galaxy player. The LA Galaxy are the 2012 MLS Champs! Back to Back! Good luck Beckham and thanks for everything you have done for this team and the MLS. It looks like Frank Lampard will sign with the Galaxy. And Arena said Donovan's coming back! Our chances of a 3peat are in our favor, ecspecially with Keane and Juninho coming back. I went to the preseason game against Club Tijuana (Galaxy 6-2 Xolos) a few nights ago as well as their last preseason game last night against the Colorado Rapids (Galaxy 2-1 Rapids) at UCSB. I can't wait to get this season started already. 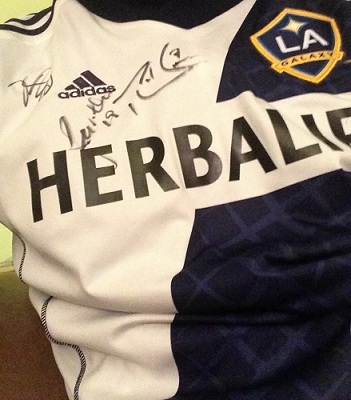 I was able to get my jersey signed by Robbie Keane, Mike Magee, and Juninho after the game.